When all else fails and the weight doesn’t come off, a patient may choose to have a procedure done to limit the amount of food the stomach can hold. In this coding exercise, you will learn how to code for a laparoscopic gastric banding procedure. Question: A 47-year-old female patient with a body mass index of 40 with uncontrolled diabetes and sleep apnea presents for surgery. Patient has been unsuccessful with dietary methods for weight control. The decision has been made to have a gastric restrictive banding procedure performed. After general anesthesia, the surgeon inserts five trocar ports and a laparoscope through the abdomen. A gastric band is placed around the upper part of the stomach and this creates a small pouch with a narrow opening that connects to the larger, lower part of the stomach. 43770 – Laparoscopy, surgical, gastric restrictive procedure; placement of adjustable gastric restrictive device (eg, gastric band and subcutaneous port components). Since CPT 43770 covers both components, no modifier is needed. Follow-up care after gastric restriction using the adjustable device typically includes subsequent adjustments throughout the postoperative period. The gastric device can be adjusted by changing the diameter of the device component. This is performed by injecting or aspirating fluid through the subcutaneous port component. 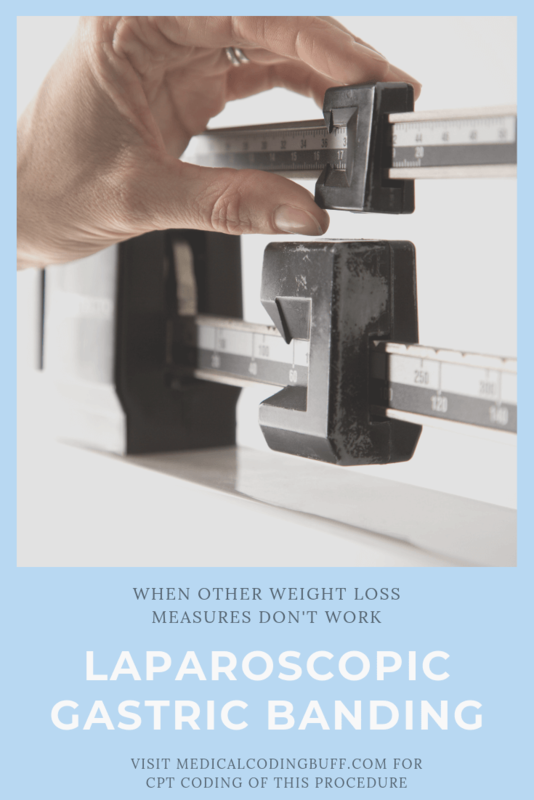 According to the U.S. National Library of Medicine, laparoscopic gastric banding is surgery used to help with weight loss when other dietary and exercise measures have been unsuccessful. This procedure is not a miracle cure for obesity. Therefore, diet and exercise will still need to be done after the surgery. The restrictive band makes the patient feel full faster so he or she can only consume small amounts of food. If the patient wants to consume more or less food at some point in the future, the physician can readjust the band. A body mass index (BMI) of 40 or more, which means men who are 100 pounds overweight and women who are 80 pounds overweight. A BMI of 35 or more in addition to a serious medical problem may improve with weight loss. Sleep apnea, type 2 diabetes, hypertension, and heart disease are some of these serious conditions. The following video explains what takes place during a laparoscopic adjustable gastric band procedure.